While cars have changed drastically throughout history, there’s one constant that all combustible engines have in common: an ignition system. In this article, we touch on the features of three ignition systems, as well advantages and disadvantages of each. High energy ignition systems use a transistorized switch within an ignition module that also handles the task of triggering the ignition coil to generate high-voltage current. This is advantageous, as the use of this electronic switch mean provides a consistent, high voltage spark throughout the life of the engine, meaning fewer misfires. The high energy ignition system still uses a conventional distributor, though, meaning they will eventually wear and require replacing, adding to potential repair costs. Also, the ignition timing cannot be as precisely controlled as with more sophisticated systems, resulting in poor fuel efficiency and lethargic acceleration. This aptly named ignition system eliminates the distributor entirely. Instead, multiple ignition coils are used – one for each pair of cylinders. This system uses a “Waste Spark” for one of the paired cylinders, pairing two pistons that will be at the top dead center at the same time. Each of the spark plugs in these cylinders will fire at the same time using the high voltage from one coil. This is beneficial, as this system can be designed to generate high voltage, and ignition timing can be precisely controlled for lower emissions. Unfortunately, a lack of moving parts means that it can be much harder to diagnose and is more expensive than a traditional system, and these systems require double platinum plugs due to reverse firing. The most sophisticated of all ignitions systems, this system places an ignition coil directly on the top of each spark plug and is ideal for modern engines. All of the ignition timing is handled by the Engine Control Unit, based on input from various sensors. Because each spark plug has its own dedicated coil, high-voltage spark plug wires are completely eliminated. This is beneficial for a number of reasons: there are no moving parts and lower maintenance costs. It should be noted that this can make it more difficult to diagnose and more expensive to repair than a traditional system, but with lower maintenance costs, repairs are less frequent. Through the use of the Engine Control Unit, this system can be designed to generate high voltage, and the ignition timing can be precisely controlled for lower emissions. 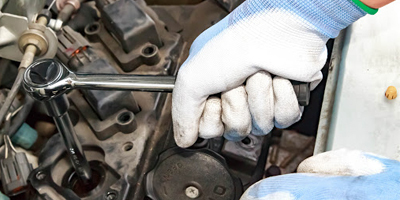 Knowing the advantages and disadvantages of each ignition system type is beneficial in choosing a spark plug that works in tandem with the performance requirements of the system. To see which Autolite spark plug works best with each vehicle, visit www.autolite.com/productfinder for more information.